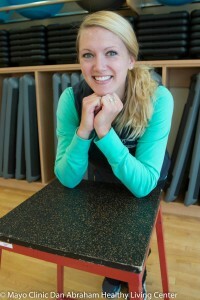 Ashlie works as a Well-Being Communications Specialist as well as a supplemental group fitness instructor. Healthy living has positively impacted her life in every way, and she makes it her mission to promote healthy living in all aspects of life. She finds great joy in meeting new people and learning their stories. We all have a story to tell, and being able to hear these stories each day gets her excited about this place. In her free time, Ashlie enjoys surfing (when home in Oceanside), paddle boarding, running, cooking and eating, traveling, dancing, cold press coffee, and, of course, spending time with her family. Something surprising about Ashlie is that she has always dreamed of being a cooking show host! Click to find one of Ashlie's classes.